Bike to School/Work Day is on Thursday, May 14, 2015. To mark this annual celebration of cycling, CVHS, Bike East Bay and BikeWalkCV are hosting an Energizer Station under the CVHS marquee at Heyer Ave and Redwood Rd from 7:00 to 9:00 am. Cyclists can show up to enjoy free refreshments, a grab bag loaded with goodies, and stimulating conversation about cycling and walking in Castro Valley. Supervisor Nate Miley and other dignitaries are planning to attend. Also on this Bike to School/Work Day, Castro Valley’s first ever “pop up” protected bike lane will appear on Redwood Rd, southbound direction, from Seven Hills to Jamison. 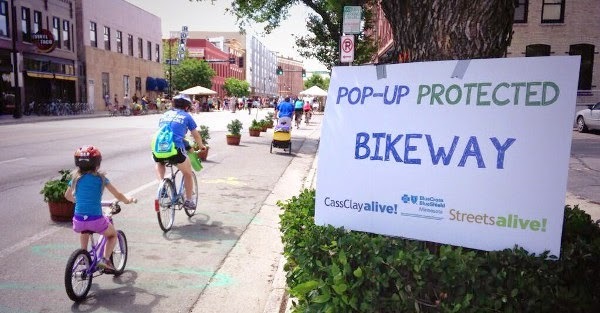 Example of a temporary, pop-up bike lane. Cyclists here will enjoy a wonderful car-free section along their route and the new “sharrow” markings on the shared portion of the route. This will allow people to experience a less stressful bicycle commute to CVHS, BART and elsewhere. Bike by and say hi!